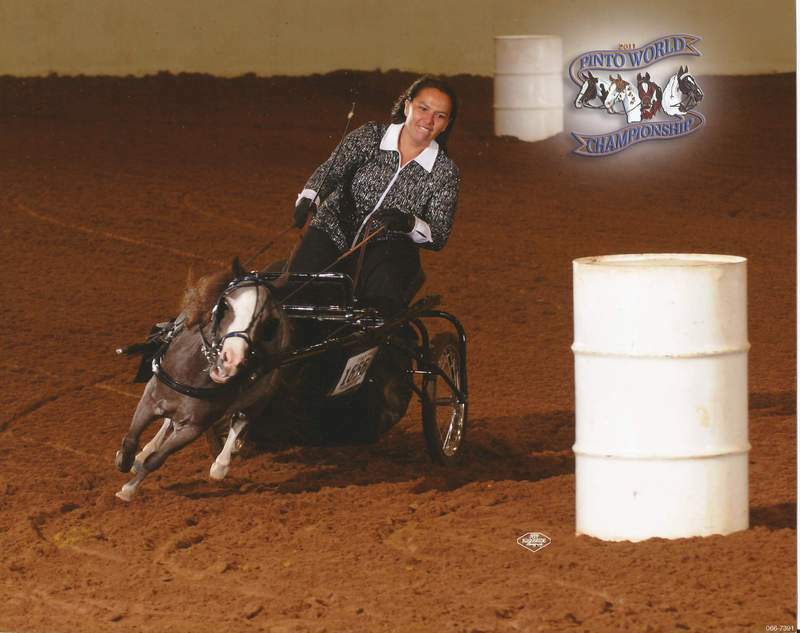 Texas LL Untouchable, owned by Ashley Waller of Beaumont, TX, had a great World Show with wins in Obstacle Driving and Jumping in Hand, and Reserves in Halter and Hunter in Hand. Numerous Top Tens in his other classes. 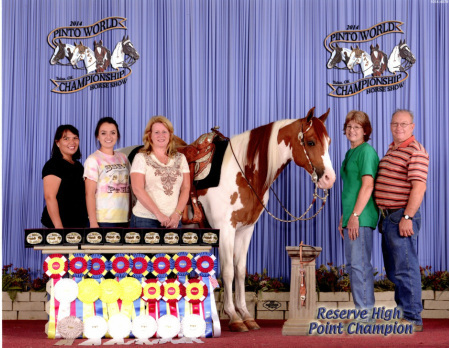 Oshquahs Brio, owned by Margaret Middleton of Silsbee, Tx, performed like the champ that he is. Wins in Dressage, Western Dressage, Western Pleasure, Ideal Pinto Western, Western Riding for a total of six World Champions and four Reserves. He was Reserve High Point Pleasure Type Horse. Maxs Double Dip, owned by Cara Barron of Silsbee, Tx, finished his World Show with two Championships, two Reserves, and numerous Top Tens. He is pictured here with his team, Annie, Clay, Carley, and Cara. 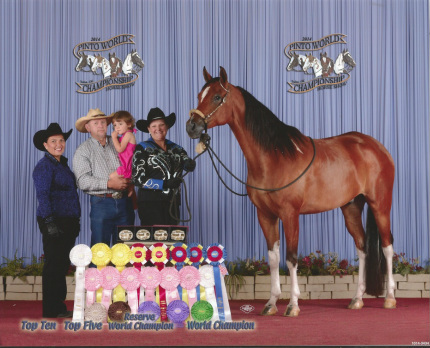 Oshquahs Brio attended the inaugural Western Dressage World Championship Show in November 2013 and came home a winner. With Annie Wiggins in the saddle he won three classes, was High Point Open horse and Overall High Point horse. Proud owner Margaret Middleton. At an age when many horses are retiring, RX Medicine Man made his debut at the 2013 Pinto World Show with Abbie Marcum handling. They competed in Driving, Trail & Jumping classes and looked great--ATC is proud of both of them. 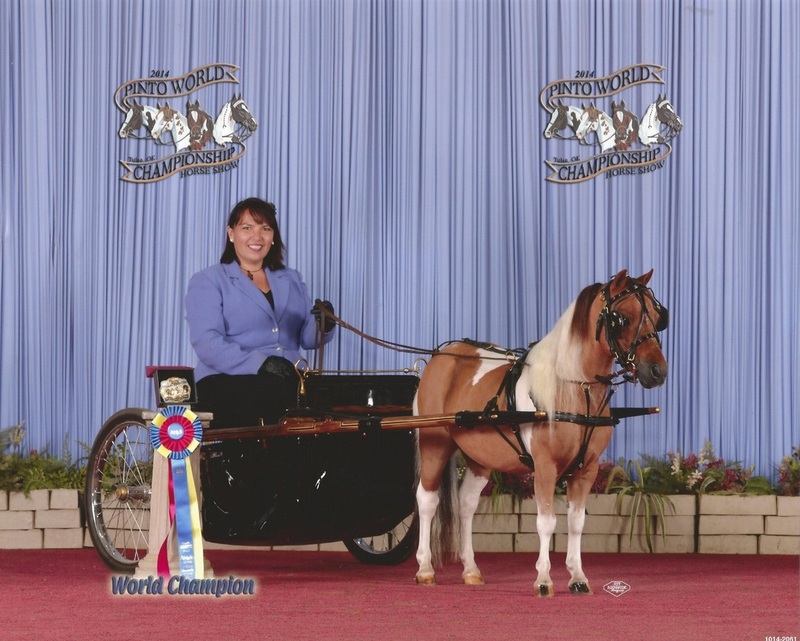 The 2011 Pinto World Show was memorable for lots of reasons, but none more than when Annie and My Elektric Storm wowed the crowd by winning the Barrel Racing leg of the Miniature Versatility class.